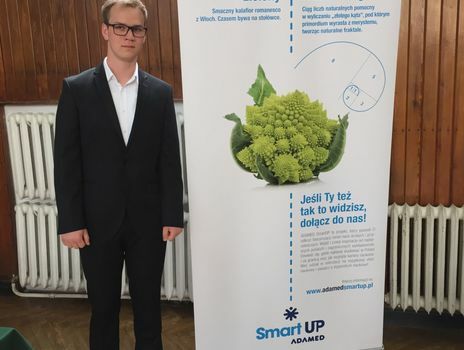 Maksymilian Głowacki, laureate of the grand prize in the 1st edition of ADAMED SmartUP programme, confirmed that he belongs to the group of the greatest young chemistry minds in Poland. He was among the winners of the 62nd edition of the Polish Chemistry Olympiad. What is more, he was awarded with a special prize for solving organic chemistry tasks from the second and third stage. The official final of this competition took place on the 18th June this year in hall of the Department of Chemistry of the University of Warsaw. 937 students from 263 schools in Poland entered the first stage of the Chemistry Olympiad. They had to get to grips with tasks covering subjects included in the school coursebooks. 378 students were successful, so they were qualified for the second stage in which the level of difficulty was raised. The last stage of selecting the most talented young chemists in Poland was entered by 101 students and took place at the beginning of April. It is the second success of Maksymilian Głowacki in the Chemistry Olympiad. In recent years he has also become a finalist of the Department of Education’s competitions in mathematics, physics and IT. The ADAMED SmartUP programme was a partner of the 62nd edition of the Polish Chemistry Olympiad.